← Christian Derangement Syndrome – Bill Maher and the Huffington Post Have It ! On Monday, March 26, the Supreme Court began oral arguments in the highly-anticipated case challenging the constitutionality of the Patient Protection & Affordable Care Act. By Wednesday afternoon, the hearings had concluded. The historic arguments consolidated an appeal from 26 states, a group representing several small businesses, and several individuals who contend that the 2010 health care law, President Obama’s signature legislative achievement, is unconstitutional. Perhaps significantly, Justice Kennedy, the Court’s notorious swing vote, appeared to be very concerned about the status of young people with respect to the healthcare bill. He noted that the government hasn’t exactly been honest about its intentions with the bill, which was to offset the burden that uninsured individuals place on healthcare. If the administration was really interested in preventing young people (many who are uninsured) from being such a burden, the healthcare plan would allow them to buy only catastrophic health insurance (instead of the plan that includes well visits, preventative care). Catastrophic health insurance is all that 20-30 year-olds really need; It’s the only product that makes any economic sense for them. But Obamacare doesn’t allow that. So, as Kennedy emphasized, we see what the healthcare bill is really all about. It’s about using 20-30 year-olds to subsidize the plan, to subsidize insurance for those who can’t afford it. It’s about using young healthy people to fund the program. It’s about a social scheme. As we all know, the government’s plan is to subsidize health insurance for everyone, especially those who are uninsured and sick (approximately 20% of all uninsured). The plan forces insurance companies to cover the sick. But it doesn’t want to use the typical means to pay for this – such as tax subsidies. Instead, the government wants to reach OUTSIDE the market and COMPEL a whole bunch of healthy people into that market so they can be used to subsidize the program and help bring healthcare premiums down. In fact, this was the finding by Congress: that bringing young healthy people into the market will bring down the health insurance premium by about 15% for everyone. Unfortunately, though, it will force them to buy something they don’t need or want. The healthcare challenge, on its face, is about the Individual Mandate – the government’s belief that it has the power under the Commerce Clause to force Americans to purchase the specific health insurance it dictates, even those who don’t need it. It is also about the fundamental scheme in place, established by our Founders and memorialized with the Tenth Amendment, that the federal government is a government of limited powers with the bulk of powers being reserved to the States where they can most effectively regulate for the health, safety, welfare, and morality of their people. It is about the section of the bill which enlarges the Medicaid program and coerces the States to participate in its healthcare scheme by threatening to withhold all Medicaid funding should they decide not to. According to the states, the sheer volume of the federal funding at stake leaves them with no practical capacity to withdraw from Medicaid. By placing all of a state’s federal Medicaid dollars at risk for the failure to adhere to the healthcare bill’s conditions, they claim the Act also amounts to compulsion. And furthermore, they claim that conditions imposed on state governments to implement the scheme constitutes impermissible commandeering of the states and their resources. But the underlying issue is individual liberty. It is about the right of an individual to be free from government compulsion – not being forced to do something against one’s will or spending one’s money (that is, what remains after the government takes its cut in the form of income taxes) on things one don’t want or need. It’s the fundamental right to conduct one’s life the way he or she feels fit and to make his or her own personal decisions. It’s the basic right “to be left alone” by government. And the decision, therefore, will speak volumes about how strongly our nation’s highest court is committed to this grand notion of individual liberty. We already know that there are several justices who believe in an expansive view of government and use the court to evolve its responsibilities. And there are those justices who believe in the strict interpretation of the Constitution and in limits to federal power. 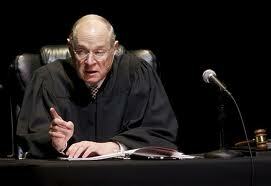 And then there is Justice Kennedy, who can be defined by neither classification. His opinion may turn out to be the deciding factor in this case. All eyes are usually on Justice Kennedy, the genial justice who sits on the fence, often keeping interested parties nervous as to which side he will side with – the liberal bloc (Justices Ruth Bader Ginsburg, Stephen Breyer, Sonia Sotomayor, and Elena Kagan) or the conservative bloc (Justices Antonin Scalia, Clarence Thomas, Samuel Alito, and the Chief Justice John Roberts). Kennedy was appointed to the bench in 1988 by President Reagan, after the Senate failed to confirm his first choice, committed originalist Robert Bork. Reagan also appointed Justice Scalia. At the time of his appointment, he was a judge on the US Court of Appeals for the Ninth Circuit, appointed by President Gerald R. Ford. The Ninth Circuit is known as the most liberal of the circuit courts, and in fact, tried to remove the words “Under God” from the Pledge of Allegiance. Justice Kennedy’s crucial swing vote has often been the decisive factor in many of our most important and controversial cases of recent years. In the 2008–2009 term, there were 16 decisions in which the justices split strictly along ideological lines. Kennedy joined the conservative members of the Court eleven times and the liberals only five. And so, all eyes were on Justice Kennedy in the case against the Patient Protection & Affordable Care Act (PPACA) and all ears were open to his questions and comments, in the hopes of providing a glimpse into his mindset regarding the administration’s huge power grab under the Act. On the first day of hearings, the justices had to entertain whether the healthcare challenge is even allowable under the Anti Injunction Act (AIA), a federal tax law that says, in essence, that a taxpayer cannot challenge a tax until it comes into effect. The provision at issue is the penalty portion of the Act, which requires that almost every individual purchase health insurance by 2014 or pay a penalty. The questions before the Court were twofold: (1) Can the penalty be classified as a “tax” and therefore implicate the AIA? And (2) If so, is it then premature for the court to consider the present challenge to the individual mandate? Justice Breyer asked point blank: “Where I see the problem is in the part of the AIA which refers to the ‘assessment or collection of any tax.’ Now, Congress has nowhere used the word ‘tax.’ What it says is ‘penalty.’ Moreover, this is not in the Internal Revenue Code ‘but for purposes of collection.’ And so why is this a tax?” He further emphasized that lawmakers intentionally did not use the term when they crafted the legislation nor did they intend the penalty as a tax. Judging on the arguments and discussion made the first day, it seems likely the case will be decided and not postponed. Even the administration’s lawyer, Solicitor General Donald B. Verrilli urged the justices to decide the merits of the dispute. “This case presents issues of great moment,” he said. Justice Alito asked Solicitor General Verrilli: “Do you think there is a, a market for burial services?” He answered in the affirmative. Alito then continued: “All right, suppose that you and I walked around downtown Washington at lunch hour and we found a couple of healthy young people and we stopped them and we said, “You know what you’re doing? You are financing your burial services right now because eventually you’re going to die, and somebody is going to have to pay for it, and if you don’t have burial insurance and you haven’t saved money for it, you’re going to shift the cost to somebody else. Isn’t that a very artificial way of talking about what somebody is doing?” Verrilli didn’t agree. But Alito pushed further: “And if that’s true, why isn’t it equally artificial to say that somebody who is doing absolutely nothing about health care is financing health care services? See, I don’t see the difference. You can get burial insurance. You can get health insurance. Most people are going to need health care. Almost everybody. Everybody is going to be buried or cremated at some point. What’s the difference? If you don’t have money then someone has to pay… Whether the State or a family member. And isn’t that what the mandate is doing? You can correct me if these figures are wrong, but it appears to me that the CBO (Congressional Budget Office) has estimated that the average premium for a single insurance policy in the non-group market would be roughly $5,800 in — in 2016. The administration estimates that a young, healthy individual targeted by the mandate on average consumes about $854 in health services each year. So the mandate is forcing these people to provide a huge subsidy to the insurance companies for other purposes that the act wishes to serve, but if those figures are right, isn’t it the case that what this mandate is really doing is not requiring the people who are subject to it to pay for the services that they are going to consume? It is requiring them to subsidize services that will be received by somebody else.” Verrilli acknowledged that this was in fact the case. He then asked: “If the government can force people to buy health insurance can it require people to buy certain types of cars? Broccoli?” Justice Scalia hinted that if everyone were forced to buy a new car, it might help lower the costs of new cars for everyone. Justice Scalia responded: “Well, that’s both “Necessary and Proper.” What you just said addresses what’s necessary. Yes, has to be reasonably adapted. Necessary does not mean essential, just reasonably adapted. But in addition to being necessary, it has to be proper. And we’ve held in two cases that something that was reasonably adapted was not proper because it violated the sovereignty of the States, which was implicit in the constitutional structure. The argument here is that this also may be necessary, but it’s not proper because it violates an equally evident principle in the Constitution, which is that the Federal Government is not supposed to be a government that has all powers; that it’s supposed to be a government of limited powers. And that’s what all this questioning has been about. What is left? If the government can do this, what, what else can it not do? But that’s not the only constitutional principle at stake in this case. An equally evident constitutional principle is the principle that the Federal Government is a government of enumerated powers and that the vast majority of powers remain in the States and do not belong to the Federal Government. Do you acknowledge that that’s a principle?” Verrilli so acknowledged. [Wickard v. Filburn (wheat case; 1924, holding that Farmer Filburn couldn’t grow wheat for his own use because, if other were to do the same, then in the aggregate, all these farmers would have no need to buy wheat on the open market and would therefore affect commerce) and Gonzalez v. Raich (medical marijuana case; 2005; holding that California’s Compassionate Use Act, which legalized marijuana for medical use, conflicted with the federal government’s Controlled Substances Act, which is a valid exercise of Congress’ commerce powers)]. Carvin answered: “The real problem are those who default on their health care payments. That is an entirely different group of people, an entirely different activity than being uninsured. The people who impose the costs on the rest of us are people who engage in a different activity at a different time, which is defaulting on their health care payments. It’s not the uninsured. Under Justice Kagan’s theory, you could regulate anybody if they have got a statistical connection to a problem. You could say, since we could regulate people who enter into the mortgage market and impose mortgage insurance on them, we can simply impose the requirement to buy private mortgage insurance on everybody before they have entered the market because we are doing it in this prophylactic way before it develops.” [Chief Justice Roberts interrupted to note that not everyone enters the housing market while everyone eventually enters the healthcare market] Carvin continued: “And my basic point to you is this: the Constitution only gives Congress the power to regulate things that negatively affect commerce or commerce regulation. It doesn’t give them the power to regulate things that are statistically connected to things that negatively affect the commerce. If they have that power, then they obviously have the power to regulate everything because everything in the aggregate is statistically connected to something that negatively affects commerce, and every compelled purchase promotes commerce.” (I admit, I initially had a hard time following that). On the third day of oral arguments, the Court engaged in a discussion of severability – whether the healthcare bill could survive if the Individual Mandate was struck down and whether other provisions could still survive. It was a tortuous line of questioning. Justice Scalia suggested many members of Congress might not have voted for the bill without the central provisions, and so perhaps it wouldn’t be fair to allow remaining portions of the bill to survive. He also was emphatic that it was not the province of the Court to go through each and every page to sort out which provision should remain and which should go. He even joked that being required to read the 2,700-page bill should fall under the 8th Amendment’s concept of “Cruel and Unusual Punishment.” Justice Sotomayor argued that it was Congress’ job to fix or scrap the bill, should the mandate be found unconstitutional. Opponents of the bill argued against severability, suggesting that simply striking the mandate while leaving in place corresponding new insurance regulations could result in a spike in premiums that Congress did not intend. Hopefully, we know where Justice Kennedy stands on matters that threaten to upset the balance of power created under our federalist system. In short, he has never been one to want to enlarge the government’s status with regard to its relationship to the States. The arguments and answers given on day two of course represent the meat of the case. I believe it is the closing remark by Attorney Carvin which holds the key to how Justice Kennedy will ultimately view the Individual Mandate. He emphasized that the ability to regulate commerce was not the same as compelling commerce for the latter would deprive individuals of individual liberty. I believe in his final analysis, Justice Kennedy will look at the implications the Individual Mandate has on individual liberty – the very precious intangible that our Founders so judiciously and ambitiously sought to protect and promote. I point to two fairly recent cases to highlight Justice Kennedy’s views on Liberty and Federalism – United States v. Lopez (1995) and Bond v. United States (2011). His words make his intentions clear. I believe his firm belief in the concept of federalism and the liberty interests it serves is an important insight as to how he may come down on the healthcare question, and especially the Individual Mandate. The history of our Commerce Clause decisions contains at least two lessons of relevance to this case. The first, as stated at the outset, is the imprecision of content-based boundaries used without more to define the limits of the Commerce Clause. The second, related to the first but of even greater consequence, is that the Court as an institution and the legal system as a whole have an immense stake in the stability of our Commerce Clause jurisprudence as it has evolved to this point. Stare decisis operates with great force in counseling us not to call in question the essential principles now in place respecting the congressional power to regulate transactions of a commercial nature. That fundamental restraint on our power forecloses us from reverting to an understanding of commerce that would serve only an 18th-century economy, dependent then upon production and trading practices that had changed but little over the preceding centuries; it also mandates against returning to the time when congressional authority to regulate undoubted commercial activities was limited by a judicial determination that those matters had an insufficient connection to an interstate system. Congress can regulate in the commercial sphere on the assumption that we have a single market and a unified purpose to build a stable national economy. In referring to the whole subject of the federal and state balance, we said this just three Terms ago: ‘This framework has been sufficiently flexible over the past two centuries to allow for enormous changes in the nature of government. The Federal Government undertakes activities today that would have been unimaginable to the Framers in two senses: first, because the Framers would not have conceived that any government would conduct such activities; and second, because the Framers would not have believed that the Federal Government, rather than the States, would assume such responsibilities. Yet the powers conferred upon the Federal Government by the Constitution were phrased in language broad enough to allow for the expansion of the Federal Government’s role.’ It does not follow, however, that in every instance the Court lacks the authority and responsibility to review congressional attempts to alter the federal balance. This case requires us to consider our place in the design of the Government and to appreciate the significance of federalism in the whole structure of the Constitution. Of the various structural elements in the Constitution, separation of powers, checks and balances, judicial review, and federalism, only concerning the last does there seem to be much uncertainty respecting the existence, and the content, of standards that allow the judiciary to play a significant role in maintaining the design contemplated by the Framers. Although the resolution of specific cases has proved difficult, we have derived from the Constitution workable standards to assist in preserving separation of powers and checks and balances. These standards are by now well accepted and judicial review is also established beyond question, Our role in preserving the federal balance seems more tenuous. There is irony in this, because of the four structural elements in the Constitution just mentioned, federalism was the unique contribution of the Framers to political science and political theory. Though on the surface the idea may seem counterintuitive, it was the insight of the Framers that freedom was enhanced by the creation of two governments, not one. Just as the separation and independence of the coordinate branches of the Federal Government serve to prevent the accumulation of excessive power in any one branch, a healthy balance of power between the States and the Federal Government will reduce the risk of tyranny and abuse from either front. . . . In the tension between federal and state power lies the promise of liberty. The Constitution divides authority between federal and state governments for the protection of individuals. State sovereignty is not just an end in itself. Rather, federalism secures to citizens the liberties that derive from the diffusion of sovereign power. The theory that two governments accord more liberty than one requires for its realization two distinct and discernible lines of political accountability: one between the citizens and the Federal Government; the second between the citizens and the States. If, as Madison expected, the federal and state governments are to control each other, see Federalist No. 51, and hold each other in check by competing for the affections of the people, see Federalist No. 46, those citizens must have some means of knowing which of the two governments to hold accountable for the failure to perform a given function. Federalism serves to assign political responsibility, not to obscure it. Were the Federal Government to take over the regulation of entire areas of traditional state concern, areas having nothing to do with the regulation of commercial activities, the boundaries between the spheres of federal and state authority would blur and political responsibility would become illusory. The resultant inability to hold either branch of the government answerable to the citizens is more dangerous even than devolving too much authority to the remote central power. To be sure, one conclusion that could be drawn from The Federalist Papers is that the balance between national and state power is entrusted in its entirety to the political process. Madison’s observation that “the people ought not surely to be precluded from giving most of their confidence where they may discover it to be most due,” (Federalist No. 46) can be interpreted to say that the essence of responsibility for a shift in power from the State to the Federal Government rests upon a political judgment, though he added assurance that “the State governments could have little to apprehend, because it is only within a certain sphere that the federal power can, in the nature of things, be advantageously administered, Whatever the judicial role, it is axiomatic that Congress does have substantial discretion and control over the federal balance. For these reasons, it would be mistaken and mischievous for the political branches to forget that the sworn obligation to preserve and protect the Constitution in maintaining the federal balance is their own in the first and primary instance. In the Webster-Hayne Debates and the debates over the Civil Rights Acts before the Senate Committee on Commerce (88th Congress; 1963), some Congresses have accepted responsibility to confront the great questions of the proper federal balance in terms of lasting consequences for the constitutional design. The political branches of the Government must fulfill this grave constitutional obligation if democratic liberty and the federalism that secures it are to endure. Although it is the obligation of all officers of the Government to respect the constitutional design, the federal balance is too essential a part of our constitutional structure and plays too vital a role in securing freedom for us to admit inability to intervene when one or the other level of Government has tipped the scales too far. Our ability to preserve this principle under the Commerce Clause has presented a much greater challenge. This clause has throughout the Court’s history been the chief source of its adjudications regarding federalism no other body of opinions affords a fairer or more revealing test of judicial qualities. But as the branch whose distinctive duty it is to declare what the law is, are often called upon to resolve questions of constitutional law not susceptible to the mechanical application of bright and clear lines. The substantial element of political judgment in Commerce Clause matters leaves our institutional capacity to intervene more in doubt than when we decide cases, for instance, under the Bill of Rights even though clear and bright lines are often absent in the latter class of disputes. But our cases do not teach that we have no role at all in determining the meaning of the Commerce Clause. The statute before us upsets the federal balance to a degree that renders it an unconstitutional assertion of the commerce power, and our intervention is required. As the Chief Justice explains, unlike the earlier cases to come before the Court here neither the actors nor their conduct have a commercial character, and neither the purposes nor the design of the statute have an evident commercial nexus. The statute makes the simple possession of a gun within 1,000 feet of the grounds of the school a criminal offense. In a sense, any conduct in this interdependent world of ours has an ultimate commercial origin or consequence, but we have not yet said the commerce power may reach so far. If Congress attempts that extension, then at the least we must inquire whether the exercise of national power seeks to intrude upon an area of traditional state concern. “The federal system rests on what might at first seem a counter-intuitive insight, that “freedom is enhanced by the creation of two governments, not one.” Alden v. Maine, 527 U. S. 706, 758 (1999). The Framers concluded that allocation of powers between the National Government and the States enhances freedom, first by protecting the integrity of the governments themselves, and second by protecting the people, from whom all governmental powers are derived. The principles of limited national powers and state sovereignty are intertwined. While neither originates in the Tenth Amendment, both are expressed by it. Impermissible interference with state sovereignty is not within the enumerated powers of the National Government, see New York v. United States, 505 U. S. 144 (1992), at 155–159, and action that exceeds the National Government’s enumerated powers undermines the sovereign interests of States. See United States v. Lopez, 514 U. S. 549, 564 (1995). The unconstitutional action can cause concomitant injury to persons in individual cases. Federalism has more than one dynamic. It is true that the federal structure serves to grant and delimit the prerogatives and responsibilities of the States and the National Government vis-à-vis one another. The allocation of powers in our federal system preserves the integrity, dignity, and residual sovereignty of the States. The federal balance is, in part, an end in itself, to ensure that States function as political entities in their own right. But that is not its exclusive sphere of operation. Federalism is more than an exercise in setting the boundary between different institutions of government for their own integrity. “State sovereignty is not just an end in itself: Rather, federalism secures to citizens the liberties that derive from the diffusion of sovereign power. Some of these liberties are of a political character. The federal structure allows local policies ‘more sensitive to the diverse needs of a heterogeneous society,’ permits ‘innovation and experimentation,’ enables greater citizen ‘involvement in democratic processes,’ and makes government ‘more responsive by putting the States in competition for a mobile citizenry.’ [All of these would protect and enlarge individual liberty and protect against an oppressive “one-size-fits-all” approach]. Federalism secures the freedom of the individual. It allows States to respond, through the enactment of positive law, to the initiative of those who seek a voice in shaping the destiny of their own times without having to rely solely upon the political processes that control a remote central power. True, of course, these objects cannot be vindicated by the Judiciary in the absence of a proper case or controversy; but the individual liberty secured by federalism is not simply derivative of the rights of the States. Federalism also protects the liberty of all persons within a State by ensuring that laws enacted in excess of delegated governmental power cannot direct or control their actions. [See ibid]. By denying any one government complete jurisdiction over all the concerns of public life, federalism protects the liberty of the individual from arbitrary power. When government acts in excess of its lawful powers, that liberty is at stake. The outcome of this historic case against the massively oppressive healthcare reform bill will no doubt shape the legacy of the Roberts’ Court, influence President Obama’s re-election prospects, and potentially deepen the ideological rift that is already dividing the country. But most importantly, the outcome will determine what impact the US Constitution still has on protecting the individual from the pernicious reaches of government. Bond v. United States, 564 U.S. ___ (2010). Audio for Wednesday’s arguments: http://apne.ws/GX1p23 (morning) and http://apne.ws/GXdZOP (afternoon).